Are you following lifestyle and fitness blogger Remi Ishizuka yet?! We're totally inspired by her over here! She blogs about life, beauty, her favorite healthy foods, her fun fitness routines (and so much more) and we're obsessed! Her new site looks AMAZING and so fun after a Restyle of our Poppy Template. 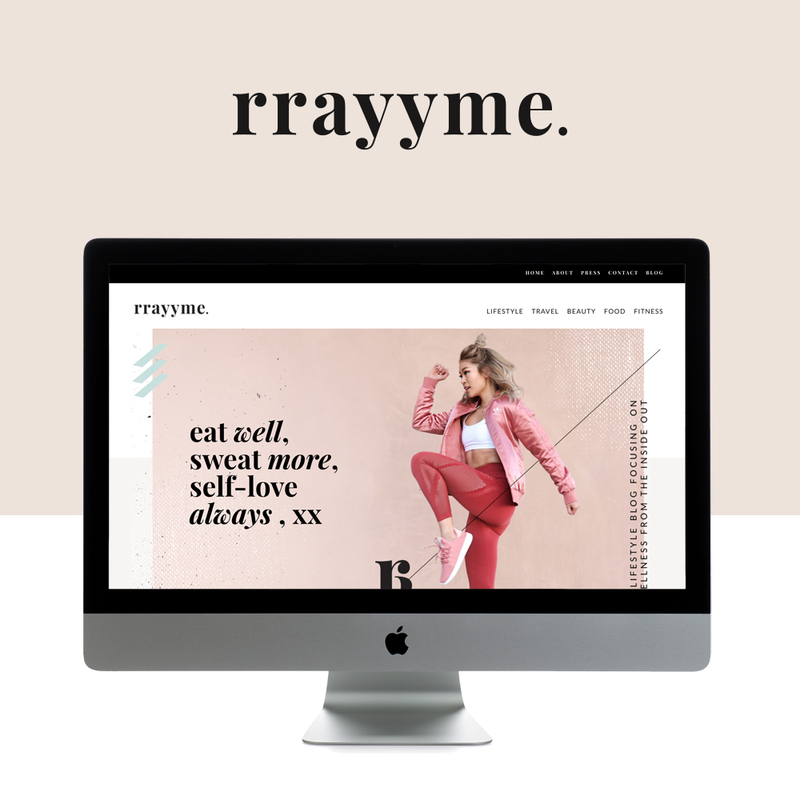 Remi came to us with some amazing ideas for her site and we loved bringing her dreams to life with the new rrayyme.com. The design was inspired by modern, edgy, high-end design and of we added a lot of colorful elements throughout to match Remi's fun personality and brand! "I can't even count how many times I've had to step out of my comfort zone these past 4 years. But, when you've accomplished it, that feeling after is THE BEST." We loved hearing about Remi's inspiring leap of faith into becoming a full time blogger and how's she has grown through her career. GO LIVE: WHERE DID YOUR PASSION FOR THE INDUSTRY OF CRAFT START? REMI: It started in my teeny kitchen (big enough for half a person) 4 years ago! I was intrigued by the colors of eating well and wanted to try it myself. Since then, I worked out every morning at 6 am, made one breakfast bowl each morning, shot it and shared it on my personal Instagram (at the time) and then went to work! GO LIVE: DID YOUR EDUCATION PREPARE YOU FOR THE INDUSTRY OR FOR STARTING YOUR OWN BUSINESS? OR ARE YOU SELF TAUGHT? REMI: I never thought this would turn into a career! I was truly just sharing my journey with my friends. Also, 4 years ago influencer marketing wasn't very big and I had no friends in the industry so I learned as I went. I took all of my own photos using a tripod, negotiated deals, and networked like crazy. It was challenging at times but I enjoyed EVERY MINUTE! GO LIVE: WHAT IS THE HARDEST LESSON YOU'VE LEARNED IN YOUR BUSINESS? REMI: Saying no! It's easy for me to say no to a partnership that is not on brand but its not so easy balancing work life and personal life. I've had to say no to personal commitments I've made in the past because of projects that pop up last minute. I'm working on finding this balance because at the end of the day what's most important to me is my family, boyfriend and friends. REMI: How to do taxes and stay organized as a small business! GO LIVE: WHAT WAS THE MOMENT YOU HAD WHEN YOU SAID, "I SHOULD DO THIS" OR WHAT MADE YOU TAKE THE JUMP INTO WORKING FOR YOURSELF? REMI: I remember the exact moment. I was debating leaving my full time job for MONTHS and it wasn't until Marcella, our office cleaning lady said "JUST DO IT! Don't wait , just DO IT!" It was soooo simple but I needed to hear that. That night I went home, wrote my 2 weeks notice and left. GO LIVE: WHAT THINGS HAVE YOU GAINED/DO YOU HOPE TO GAIN IN YOUR LIFE FROM FOLLOWING THIS DREAM? REMI: GROWTH! Personally, physically, mentally...I'm grateful that my line of work constantly challenges me. I can't even count how many times I've had to step out of my comfort zone these past 4 years. But when you accomplished it, that feeling AFTER is THE BEST. I chase after that! REMI: Rebranding and restyling my blog has been on my mind for at least 2 years but I kept putting it off. 2018 came around and I said "enough is enough!" I have to get this done. I knew that Go Live HQ works FAST and I didn't want to wait anymore so I made up my mind and went for it and I'm SOOOOO HAPPY I DID! Follow Remi on Instagram for more fitness & lifestyle inspiration! Want this look? Get the Poppy Template!